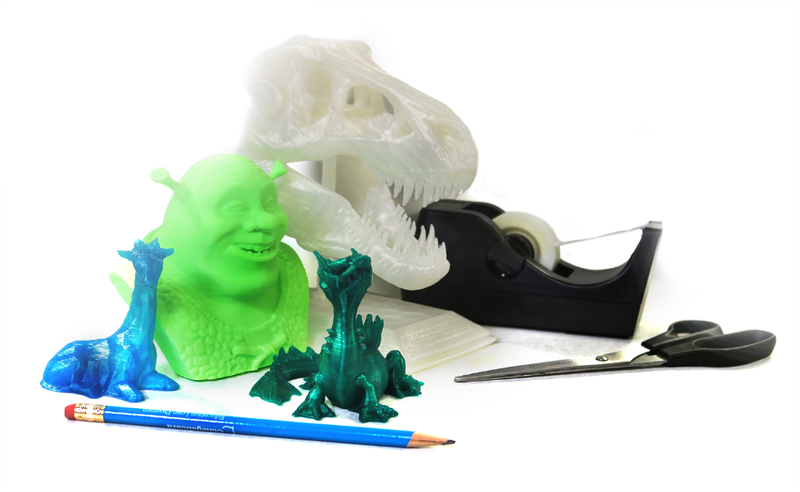 High Point › Library > Students > 3D Printing at HPU Libraries: What will you Create? 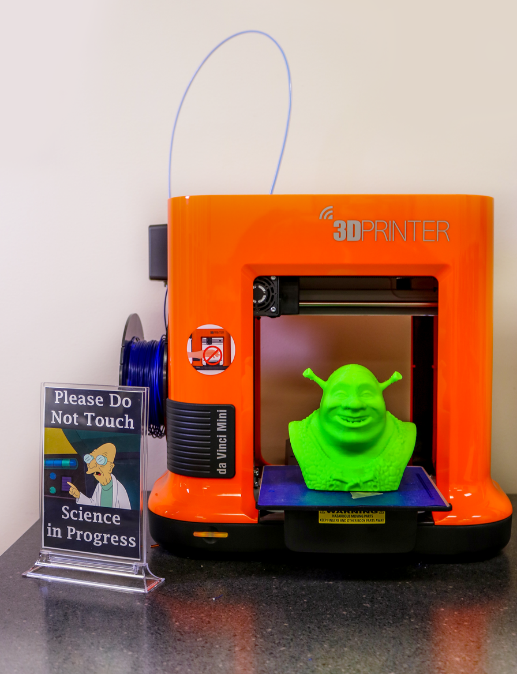 3D Printing at HPU Libraries: What will you Create? The term “3D printing” gets tossed around a lot in modern conversation. Most of us have a very basic understanding about what 3D printing is; we know that a 3D printer creates more tangible products than a standard printer. It’s a pretty cool idea just to think about. Popular television shows like The Big Bang Theory have addressed the use of 3D printing; more specifically, the characters of The Big Bang Theory were able to print realistic looking dolls of themselves using one of these printers. However, is this all that 3D printing is really used for? Now that 3D printing is a service offered by HPU libraries, it is a good time to think about what exactly 3D printing is, how it works, and what it can offer us. To the surprise of this librarian, the world of 3D printing is far more complex than one might expect. The concept of 3D printing is also not as new as many people might think. Merriam-Webster offers a definition for “3D printing” as early as 1992 (Merriam-Webster, n.d.) At the most basic level, the Oxford English Dictionary (OED) defines “3D printing” as “the action or practice of creating a physical object from a three-dimensional digital model by means of a 3D printer” (Oxford University Press, 2018). The Encyclopedia Britannica defines “3D printing” as “a manufacturing process that builds up a three-dimensional object layer upon layer” (Steele, 2014). Other terms often associated with 3D printing include “desktop manufacturing” or “additive manufacturing” (Merriam-Webster, n.d.). The image above is an example of a 3D print from our very own 3D printer at HPU libraries. These terms and definitions are all well and good, but they are really only the beginning of the conversation. Why do people use 3D printers today? What does 3D printing have to offer to the modern world? What can people really use 3D printers for these days? To answer this question, it is important to remember the term “additive manufacturing” that was described earlier, with a focus on the word “additive.” Additive manufacturing, at its core, is when a product is made by an additive process, where additions are made to a product until it becomes the desired product; this differs from “subtractive manufacturing” in which subtractions are made from products to produce the desired product (Steele, 2014). According to Encyclopedia Britannica, Steele (2014) expresses that the additive process, which 3D printing is known for, can happen in multiple ways; these include stereolithography, fused deposition modeling, and selective laser melting. Each one of these extensions of 3D printing has value to the manufacturing process. For more information on these extensions of 3D printing, please refer to the online version of Encyclopedia Britannica. 3D printing has applications in many types of manufacturing industries as well as other fields, such as education, interior design, computer science, auto mechanics, and medicine. Manufacturing car parts via 3D printing may lower the cost of replacing that bumper on your 1968 Plymouth Roadrunner because original parts for the car may be hard to find and costly to replace. Another form of 3D printing, known as “bioprinting,” is particularly innovative. Little and Wallace (2016) define “bioprinting” as not just an extension of 3D printing, but as a method of utilizing a process nearly identical to traditional 3D printing to manufacture biological materials such as bone, skin, blood vessels and even complete human organs for use in medical procedures and research. The process of bioprinting provides doctors with ways to provide extraordinary care to their patients because they are able to manufacture living materials specifically designed for their patients (Little & Wallace, 2016). Little and Wallace (2016) warn readers that the bioprinting process is still far from perfect and complex human organs are still far from being ready to be used in surgical procedures. Despite this caveat, bioprinting offers the medical profession the opportunity to help patients and perform advanced medical research so that future generations may be able to manage or even cure devastating diseases. How can I 3D Print at HPU Libraries? While HPU librarians are not able to print fully functioning human organs, we know a thing or two about the 3D printing process. Our 3D printer is located in the 1st floor makerspace at Smith Library. Makerspaces are spaces where people can come together to innovate and create. Are you tired of looking at 2D objects and scratching your head when you could be learning new things and discovering new ideas by using 3D objects? If you are interested in creating something new with the 3D printer at HPU libraries, or simply learning about the process of 3D printing, all you need to do is visit our 3D printing research guide. With this guide, you can learn more about the basic process of 3D printing, find online programs that offer design templates, learn about the different materials used by 3D printers to create 3D models, and how the library can assist you in creating a new 3D print. As this librarian expressed earlier, 3D printing is far more complex than one might think. When in doubt, ask a librarian.